Limn A Slightly Better Shelter? On January 26, 2017, the IKEA refugee shelter was declared the worldwide Design of the Year in a unanimous decision. When I interviewed one of the jurors about the process I was told that they’d chosen the “obvious winner”: the IKEA shelter was high profile, it had featured widely in the media, it was a positive story with a clear social purpose, and it offered a practical solution to the so-called “refugee crisis,” one of the most significant issues of the previous twelve months. The London Design Museum has been awarding the “Design of the Year” for a decade now, celebrating examples that “promote or deliver change, enable access, extend design practice, or capture the spirit of the year” (Beazley 2017). 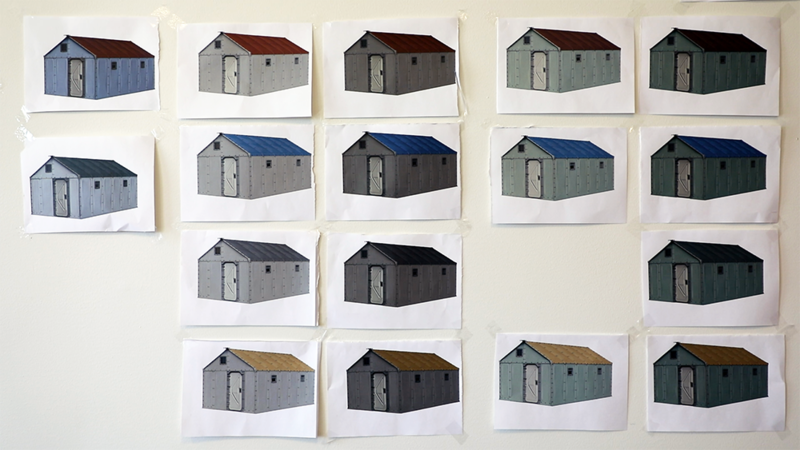 The IKEA refugee shelter seemed to match all of these aims, claiming to be modular, sustainable, long lasting, recyclable, easily assembled, affordable, and scalable. It was installed on the Greek islands to shelter newly arrived refugees in 2015, and it came with the backing of the United Nations (UN) Refugee Agency, who purchased 15,000 units for distribution around the world. The juror I spoke to explained that the shelter won because it “tackles one of the defining issues of the moment: providing shelter in an exceptional situation whether caused by violence and disaster…. [It] provides not only a design but secure manufacture as well as distribution.” A statement described the project as “relevant and even optimistic,” concluding, “it shows the power of design to respond to the conditions we are in and transform them” (Beazley 2017; personal interview, April 25, 2017, Design Museum, London). It is easy to understand why this shelter has generated so much interest since it was first announced in 2013. It has received funding from IKEA, a company that has shaped so much of everyday life in the Global North and whose minimalist modernism has populated so many domestic environments. As Keith Murphy points out, there is a social democratic spirit underpinning so much of Swedish design, a combination of simplicity, affordability, and universality that both reflects and promotes a more egalitarian social order (Murphy 2015; see also Garvey 2017). When applied to refugee housing, this has all the makings of positive story. The media are given something their readers can relate to—the experience of unpacking and constructing IKEA flat-pack furniture—and can connect it to a problem that concerns us all: how to house the millions of refugees we see on the news. 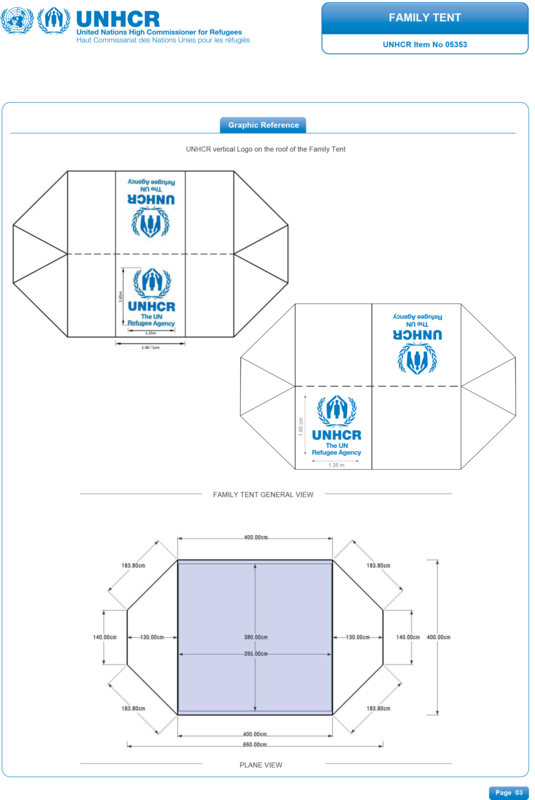 The IKEA refugee shelter, the story goes, can be assembled in four to six hours with a basic manual and no specialist tools. Everything comes in two compact boxes, much like those that contain your new bed and table from the IKEA store. More attractively, the design arrives with a number of innovative little tricks, including a photovoltaic panel that provides sufficient electricity to power a small light and mobile phone charger. It seems like a heartwarming example of philanthro-capitalism, good design, and humanitarian innovation (Scott-Smith 2016). What’s not to like? For anyone who has actually seen the shelter up close, it looks rather mundane after this hyperbolic description. It has a rectangular floor plan, vertical walls, and a pitched roof. The shelter is fairly small, covering an area of 17.5 square meters, and it is designed to house a family of up to five people. When inside, you can look up and see the entire structure laid bare: a standalone steel frame with imposing horizontal beams, onto which foam panels are clipped. These panels are made from polyolefin, a light, flexible plastic, and they have the feeling and texture of swimming floats. They have been attached to the frame with hand-tightened bolts and brackets, and the shelter has four small ‘window’ openings, ventilation slots, and a lockable door. The main designer described its chunky, basic appearance as the kind of house “a 5-year-old would draw” (personal interview, May 18, 2017, Stockholm). It is, indeed, visually uninspiring, but this is because it is meant to be basic. Like much of IKEA’s product line, it is mass-produced, economical modernism. It is meant to offer a shelter that is immediate, quick, affordable, and easily transportable, staying as close as possible to the price and weight of the main alternative: the tent. “It is, indeed, visually uninspiring…” The IKEA Shelter. Photos: Mark E. Breeze. Tents have been the go-to shelter for humanitarian organizations for more than 50 years. The UN Refugee Agency distributes tens of thousands of them annually, and they are still valued for their lightweight, inexpensive simplicity. To be taken seriously as a humanitarian product, therefore, the IKEA shelter needs to be comparable to the tent in terms of price and weight while making some crucial improvements. There are four, in particular, that can be found in this design. First, the IKEA shelter provides increased security through a lockable door. Second, it provides greater privacy through firmer and more opaque walls. Third, it provides improved communication with a mobile phone-charging station. And fourth, it lasts considerably longer: up to four years rather than just one. These improvements encapsulate the basic requirements for dignified living according to the designers, combining security, privacy, durability, and connection to the outside world. These features, the narrative goes, are particularly important given the protracted nature of so many contemporary refugee situations and the likelihood of a lengthy exile. When I spoke to the designers about dignity, they came back again and again to the same material expressions, which were fascinating in their tangibility and their conception of refugee social worlds. Dignity meant being able to stand up in the IKEA shelter, which is impossible in a tent. Dignity meant having walls that were “knocky”: firmer, more secure, more resonant when tapped, which distinguished the materials from tarpaulin. Dignity meant privacy: whereas silhouettes can cause a problem in tents, the IKEA shelter does not reveal activity inside when the lights are on at night; its material is more opaque and disperses the shadows. Such improvements, however small, allow the design team to mobilize a more expansive, idealistic rhetoric. In its publicity materials, the shelter has become a “safer, more dignified home away from home for millions of displaced people across the world.” It has channeled “smart design, innovation and modern technology” to offer “a sense of peace, identity and dignity.” It is “universally welcoming”, a “home away from home” that balances “the needs of millions of people living in different cultures, climates and regions with a rational production—a single solution” (Better Shelter 2015; personal interview, May 19, 2017, Stockholm, Sweden). Far from being a better tent, this shelter has some revolutionary ambitions. But is it a better tent? Does it live up to its aims of producing a compact, cheap, lightweight product for meeting a basic human need? The day after the announcement of the prize I sensed a collective sigh of despair among my colleagues working on refugee issues, which was tangible in personal conversations, snarky asides, and exasperated emails. The failures of the shelter were, for many of them, far too obvious. It was meager, limited, with no proper floor, no insulation, no natural light, and with a structure that let in drafts and dust. It had been oversold, under-ordered, and was described as sustainable when in fact it involved flying piles of metal and plastic around the world. It ignored established practice in the humanitarian shelter sector, which advocates the use of local materials and abundant local labor, and, above all, it was accompanied by an insistent triumphalism, with media reports pushing the narrative that an intractable problem had been solved. It had not. Managing refugee arrivals is a complex political issue that requires sustained political engagement, legal reform, and advocacy in host states to ensure investment in welfare and protection. Although these were not the aims of the IKEA refugee shelter, such lavish praise and attention, my informants felt, were a distraction. Many such “innovative designs” have become a fetish, creating a mistaken reassurance that circumstances can be controlled while obscuring a series of more serious, structural issues that remain unaddressed (Scott-Smith 2013). The most tangible criticisms of the IKEA shelter, I soon realized, came from two opposing directions. On the one hand, there were those who argued the shelter did too little. It was a mean little space, they suggested, that looked like a garden shed or, due to its plastic panels, a chemical toilet. This line of critique usually came from architects, who filed the object contemptuously under “product design” and declared that it involved no architectural thinking at all. Architecture, they pointed out, should respond to the site and local environment, not mass-produce a universal design with no adaptability or control. Architecture should create sensitive and carefully planned responses to specific problems, not ignore basic elements such as insulation, proper flooring, and natural light. Architecture should also be pleasing to the eye. If you took the Vitruvian triad of architectural virtues, the IKEA shelter seemed to fail on every count. Firmitas, utilitas, and venustas was the aim, but the shelter was flimsy rather than firm, flawed rather than useful, ugly rather than beautiful. It was particularly galling for this group of critics that the shelter won not just Design of the Year, but that it won the architectural category as well. The other type of criticism came from humanitarians. They argued not that the shelter did too little, but that it did too much. It provided a fully integrated, flat-pack solution when this was rarely required or appropriate. It flew in a prefabricated house when there were better opportunities to work from the bottom up. It lionized designers when design was rarely a priority. Unlike architects, humanitarians were working in a context of limited time and limited resources. They worked with the mantra that “shelter is a process not a product,” a slogan that derives from the work of Ian Davis (1978), one of the founding thinkers of the humanitarian shelter sector, who argued that humanitarians needed to focus on the way people shelter themselves. Davis said that disaster-affected communities had their own techniques for finding and building shelter, suggesting that humanitarian shelter should mean discouraging designers and other outside “experts.” The priority should be to provide materials such as wood, nails, tarpaulin, and tape that help people build their own homes. These could be used and reused as people expanded their accommodation. The crucial task, in other words, was not to provide finished shelters, but to support people in their own process of sheltering. In the middle of May 2017, I took a trip to Stockholm to meet the IKEA shelter’s design team and see how they navigated these two very different criticisms. I arrived at their headquarters on the 11th floor of the old Ericsson building in a southern suburb of the city, and spent some days learning about their brief, their aims, and their ways of thinking. The first thing that became clear was that this was not, in fact, an “IKEA shelter.” It was a designed by a group of independent Swedish industrial designers who had met at college and developed the basic idea in discussion with humanitarians in Geneva. They later received substantial financial support from the IKEA Foundation, which allowed them to refine, test, and iterate the idea, eventually leading to a commitment from the UN Refugee Agency to purchase a large number of units. As I learned more about the project, it soon became clear that the story of the shelter seemed to be constantly swinging like a pendulum. It was caught between the expansive utopian idealism that so often underpins the announcement of new humanitarian designs and the restricted, mundane implications of their actual implementation. Both types of criticism, in other words, were basically correct: the IKEA shelter is both ‘too much’ and ‘too little’. It is clearly a product rather than a process, so it ends up being overwrought, top-down, and “too much” for aid workers who are skeptical of universal solutions. At the same time, it has been designed to be cheap and lightweight, so it will always be “too little” for those with bigger ideas about what design can achieve (especially as it lacks many of the basic elements that are crucial to architecture, such as proper flooring, insulation, light, strength, and beauty). The formal name for the shelter seems to encapsulate this tension. It is properly called the “Better Shelter”, and I was reprimanded in Stockholm for using the name “IKEA shelter,” which remains in common parlance but has never been formally adopted. This name emphasizes the restricted horizon of improvement. The product aspires to be better, but it is no more than shelter. It idealistically attempts to improve the world, but pursues this by providing basic shelter rather than engaging with a more expansive terrain of housing. “…a fire safety test on the IKEA shelter.” Photo: Mark E. Breeze. 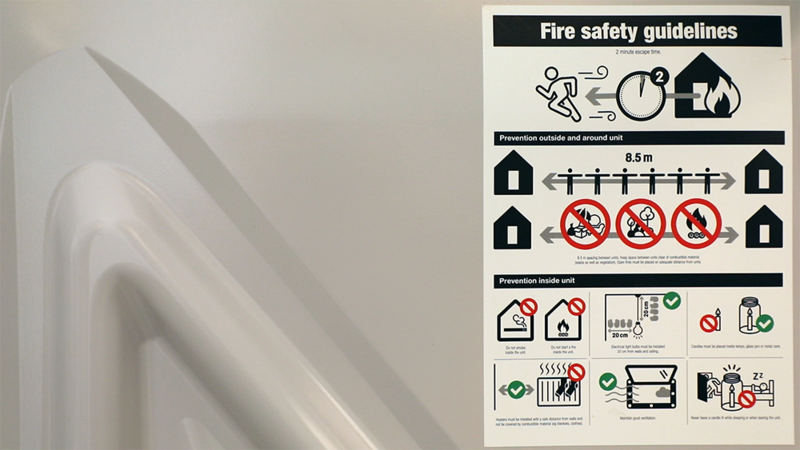 The problem of doing too much and too little was powerfully illustrated in December 2015, when the Swiss city of Zurich conducted a fire safety test on the IKEA shelter. The video of the test was screened on the news and subsequently circulated online: it featured a series of terrifying images in which a small fire, illuminating first the translucent sides of the shelter, suddenly engulfed the scene in an explosion of flames and molten plastic. The media picked up on the story, Zurich cancelled its intended use of the shelters for new migrant arrivals, and distribution of the shelter began to slow. This was perhaps the biggest challenge the design had faced since its inception, and the fire test led to more than a year of additional work as the team made changes to the shelter’s design – mostly adjustments to the panel material. During this process, however, the design team found no clear code to work. Fire retardancy standards and testing procedures could not be found in the usual humanitarian handbooks, and so the team felt hostage to unrealistic criteria. The Swiss tests had compared the shelter with a permanent residential building, which seemed unfair (as a tent, which was the closest equivalent, would fare no better), yet it seemed impossible to object when the Swiss fire tests were released. The shelter was meant to be “better,” and the whiff of double standards would drift over the scene very quickly if they argued this was a shelter for a different population. The idea that refugee accommodation should be held to lower standards would not be good publicity for a product so concerned with the promoting dignity. The fire tests raised a number of questions. Is this a “slightly” Better Shelter? Or is it “sometimes” a better shelter, depending on location and context? And when, exactly, is it a better shelter – in which times and places? One thing is clear: most people would not choose to live in one of these structures because of its obvious limitations. It has no floor or insulation, barely any natural light, and a tiny living space, even if its three or four tangible improvements certainly make it better than a tent. But then again, it should be better, as it costs a good deal more than a tent: currently twice the price of a UN High Commissioner for Refugees (UNHCR) standard family model. Is this a problem? Don’t we expect a better shelter to be a more expensive shelter? Yet how much is too much? What if twice the price means aiding half as many people? Is this a “better” result? As the IKEA shelter becomes more widely used in different locations, a clear lesson has begun to emerge: that the whole product is deeply dependent on context. It is only “better” in some times and places. It may be “better” when compared with a tent, but not when compared with a Swiss apartment building. It may be “better” in a Middle Eastern refugee camp, but not in a Western European reception facility. It may be “better” when funds are plentiful and refugee numbers limited, but not when refugees are plentiful and funds limited. It might be “better” when there is an urgent need for emergency shelters, but not when there is scope for people to build a home of their own. Perhaps this, in the end, defines the wider world of little development devices and humanitarian goods: they are simultaneously too much and too little. They are vulnerable to the charge of being too limited as well as the charge of being too expansive. They fail to tackle fundamental global injustices, but they still make numerous ideological assumptions about human life and human dignity beneath their search for modest improvements. The little development device oscillates between its grand visions of human improvement and its modest engineering in a tiny frame. The humanitarian good balances a philanthro-capitalist utopia with the minimalist aim of saving lives. All of this is encapsulated in the slightly Better Shelter. When I discussed these thoughts with the team in Stockholm, they basically agreed, and reached for the Swedish word lagom to describe their aims. It is tricky to translate, but means something like “the right amount,” “neither too little nor too much.” The Better Shelter is lagom because it has to be viable as well as adding value. It has to negotiate with the critics who claim it is “too much” as well as those who say it does “too little.” The shelter could never please architectural critics because it was only designed as a cheap, short-term home, and it would never please bottom-up humanitarian practitioners because it was too top-down and complete. Lagom captures the search for balance while reflecting a wider ethos of democratic Swedish design. Yet aspiring to be lagom does not make the central tension disappear. Just like being “better,” being lagom depends on context. What counts as “just enough” depends on where you are, who you are, and what you are doing. Something lagom in Sweden may not be lagom elsewhere. This became apparent just before the Better Shelter was launched, when a handful of units were shipped to Lebanon for a practical test with refugees. On their arrival in the Bekaa Valley, a group of armed and angry Lebanese neighbors appeared. The shelters, in their view, were too permanent. It did not matter that they had no foundations. It did not matter that they could be removed in less than a day. It did not matter that the walls and roof would degrade in just a few years. The structures were too solid, and the authorities agreed. The Better Shelter had become “too much” for the Lebanese political context, just as in Switzerland it had become “too little.” The same features that made it insufficient in one country made it extravagant in another. So although the Better Shelter tries to be better everywhere, it can never hope to adapt to the infinite complexity of refugee crises and its scales became disrupted when butting up against hard political realities. 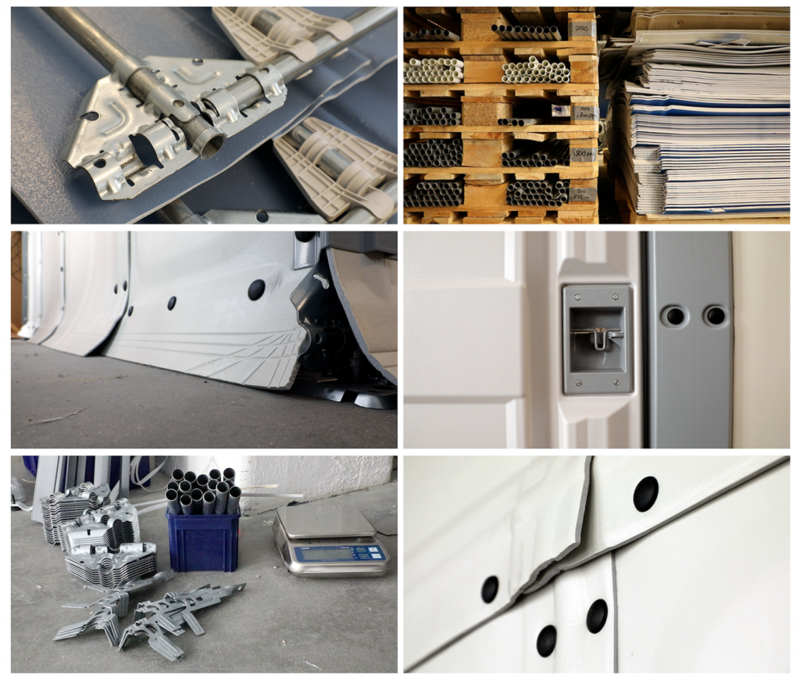 Since 2013, the designers have been working assiduously in Stockholm to optimize every component: changing the clips and panel material, redesigning the bolts and vents, refining the door and frame. They think an improved product can overcome both the Swiss fire tests and the Lebanese resistance. But what is “better” will always change with context. The Lagom Shelter can only be truly Lagom on the 11th floor of the old Ericcson building in Stockholm. As soon as it moves, the balance changes. Lagom cannot be built into any universal form. The phrase “IKEA refugee shelter” is a misnomer. As explained below, this object has been produced by a group of Swedish industrial designers who received financial support and sponsorship from the IKEA Foundation. The formal name for the product is the Better Shelter, but the phrase “IKEA refugee shelter” is still widely used. I continue to use it partly for the sake of recognition, and partly to highlight the intimate connection with IKEA, which is central to the story of this product despite being made distant through several degrees of institutional separation. I use scare quotes around the idea of “crisis” here for three reasons: first, because the “refugee crisis” is based on a doubtful claim that the number of refugees in the world today is “unprecedented”. Second, because much larger refugee numbers routinely arrive in developing countries – this situation is only a “crisis” because it has affected the rich world. And third, the crisis has not been a result of refugee numbers, which is relatively manageable, but the political response. If anything, this is not a refugee crisis, but a hospitality crisis. 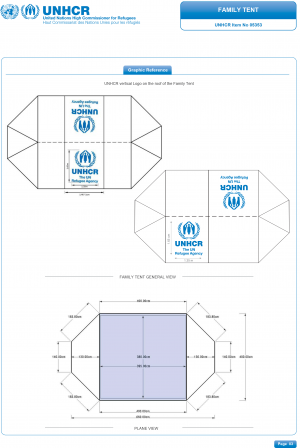 The whole design of this shelter emerged in part from UN High Commissioner for Refugees’s (UNHCR’s) recognition that refugees are spending ever-longer periods in camps, and therefore tents are no longer suitable due to their short lifespan. For this reflection on the relationship with the Vitruvian virtues, I am grateful to Mark E. Breeze. The critics do not even agree. Humanitarians have their biases; architects have theirs. I have written about this tension in the June 2017 issue of Forced Migration Review (Scott-Smith 2017). Its previous name was the Refugee Housing Unit (RHU), which made for a popular humanitarian acronym but was never very catchy. The rebrand as ‘Better Shelter’ tried to quash the use of “IKEA Shelter” completely, which is too reminiscent of corporate sponsorship. IKEA have developed a Lagom project in recent years. See here. For more on the political circumstances of the “no camp” policy in Lebanon, see Sewell and Alfred (2017). Better Shelter. 2015. Better Shelter: A Home Away From Home. Better Shelter Promotional Leaflet. Available at link. Davis, I. 1978. Shelter After Disaster. Oxford, UK: Oxford Polytechnic Press. Garvey, P. 2017. Unpacking Ikea Cultures: Swedish Design for the Purchasing Masses. London, UK: Routledge. Murphy, K. 2015. Swedish Design: An Ethnography. Ithaca, NY: Cornell University Press. Scott-Smith, T. 2013. “The Fetishism of Humanitarian Objects and the Management of Malnutrition in Emergencies.” Third World Quarterly 34(5): 913-28. ———. 2016. “Humanitarian Neophilia: The Innovation Turn and Its Implications.” Third World Quarterly 37(12): 2229–2251. ———. 2017. “The Humanitarian-Architect Divide.” Forced Migration Review 55:67-8. Sewell, Abby, and Charlotte Alfred. 2017. “Evicted Refugees in Lebanon Have Nowhere Left to Run.” Refugees Deeply, September 28. Available at link.